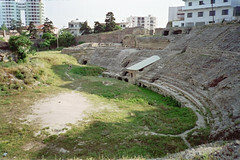 Ancient Roman ampitheatre in Durres, Albania. Athens. Cradle of civilization, where 2500 years ago the ancient Greeks invented democracy, philosophy, and the Olympics. Or did they? I ask you: where's the proof? Yeah, yeah, I know: "the proof's all around you! The Acropolis! The Parthenon! The Temple Of Zeus! The Olympic Stadium!" Uh-huh. I seen 'em. The Acropolis is a construction site, the Parthenon and Temple Of Zeus are covered in scaffolding, and the Olympic Stadium is flanked by a pair of enormous construction cranes. It really makes you wonder. Athens itself is a nice place, a bit of a dive, but I like dives. The Greeks very sensibly herd the vast majority of tourists into a warren of shops and cafes just below the Acropolis. The entire rest of the city is under destruction for next year's Olympiad, and the streets are labyrinthine, but fortunately it's a good place to get lost in. I like the way that glitzy shopping areas and grimy suburbs alike can suddenly be interrupted by exquisite Orthodox churches that look like wedding cakes, or (allegedly) ancient ruins and pillars. And you can pick up fresh spanakopita on basically any street corner. Mmm. From Athens I took the train north to Thessaloniki, and from there into Skopje, the capitol of the Former Yugoslav Republic Of Macedonia. Well, actually, no. Lesson learned: even if all previously available information states that Canadian passport holders may purchase a Macedonian visa at the border rather than in advance, the only opinion that really matters is that of the Macedonian border police. It might be for the best that I was bounced, as the way things were going, it looked like Dragosic, the wild Serbian man who co-inhabited my train compartment, was going to either challenge me to a duel to the death or offer me his daughter's hand in marriage before the ride was over. The Greeks gave me a free ride back to Thessaloniki, where I spent a pleasant day exploring the cafe-laden city before hopping a bus to Albania, which has a truly fearsome reputation in Greece; all passengers had to go through a metal detector, and run their bags through an X-ray machine, before they were allowed onto the bus. I've passed through a fair few land borders before, and this was a first. (Ironically the only other destination for which I can envision it happening is the USA). ABG: "Entry tax, twenty euro." The bus deposited us in Korce, a town an hour from the border. Nicky, an eccentric British missionary I met on the bus, kindly put me up at her house in a nearby village. A nice and exceedingly hospitable person, but she had a disconcerting habit of ranting about the miserable, greedy, thieving Albanians. If her neighbours (who fed me coffee and chocolate in the morning) and all the other people I've met here are anything to go by then she couldn't be more wrong. "Happy, pleasant, friendly, generous, and welcoming" would be more like it. In fact all of Albania seems to have been the victim of bad press. It's not near as backward and Third World as its reputation would indicate. The countryside is lovely, featuring red-brick rural villages set amid rippling green hills, olive groves and herds of goats, and Lake Ohrid, a vast, misty lake surrounded by rugged granite hills. Future European cottage country, mark my words. Buy your waterfront property now while it's cheap. The landscape is admittedly made a little surreal by the 750,000 little domed concrete pillboxes that the paranoid Hoxha administration placed all over the country, particularly along roads and waterfronts, to protect Albania from the expected hordes of invading armies. Although when you consider events in Yugoslavia in the 90s this sadly seems more sensible than crazy. Further evidence of Albanians being incredibly welcoming: like most developing nations, transport from town to town is handled by minibuses, here called furgons. The driver of the furgon that took me to Tirana bought me a coffee at a roadside cafe en route, drove me to the doorstep of my destination rather than the bus station without being asked...and refused a tip. It's also considerably less isolated than I expected. At said roadside cafe I wound up trading Cameroonian travel tales, in French (somewhat broken on my side), with a Greek-Albanian kid who had just spent two years living there. This isn't quite as weird as it may sound -- most Central African countries have significant Greek communities -- but is still pretty weird. Tirana, the capitol, is a pleasant enough city to spend a day. Poor by European standards, sure, and in that stage of development where urban developers seem to get a bonus for making their cheap new buildings as ugly as possible, but at the same time fairly cosmopolitan, with a thriving cafe culture and even some interesting architecture in an avant-garde-Stalinist-igloo kind of way. And despite Albania being theoretically an Islamic country the women have adopted the Greek fashion of Skimpy And A Size Too Small. After a brief internal struggle I managed to overcome my natural disapproval. I'm now in Durres, a nearby city on the Adriatic where cheap tourist hotels have been sprouting like pimples along the waterfront to handle Italian tourists who come here on direct ferries from Bari and Trieste. Unfortunately the waterfront and beach are under ugly reconstruction, but there are remnants -- a wall, a big amphitheatre, pillars and baths -- of the city the Romans built here back in the day, and once you get out of the city proper, the coastline is beautiful. It's also a useful setting for my planned refugee-smuggling book. And it was fun watching Real Madrid on TV while sitting atop an ancient Roman guard tower that has now been repurposed as a bar. Next up: another couple of days on the Albanian coast, a refilling of moneybags (the banking system is here is kinda primitive, but I should be able to get a credit-card advance in leke, the local currency, and then convert that to euros on the street) and then off to the UN protectorate of Kosovo. Thence to "the pearl of the Mediterranean", Dubrovnik, in Croatia. I'll keep y'all posted.